Davao City Mayor Inday Sara Duterte-Carpio took to social media to share her reaction towards Mariel de Leon losing the Miss International 2017 pageant. Mariel is a known critic of Sara’s father – President Rodrigo Duterte. “Meron ako personal experience sa kanya, but I’m too tired to make kwento. “I believe pageant judges see through the physical beauty and examine the heart. 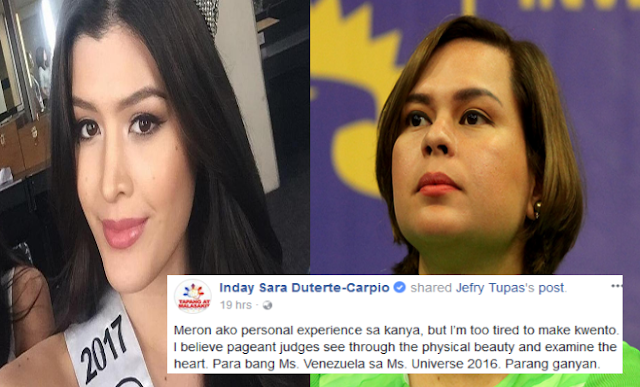 Para bang Ms. Venezuela sa Ms. Universe 2016. Parang ganyan. “This is a schadenfreude moment for me. 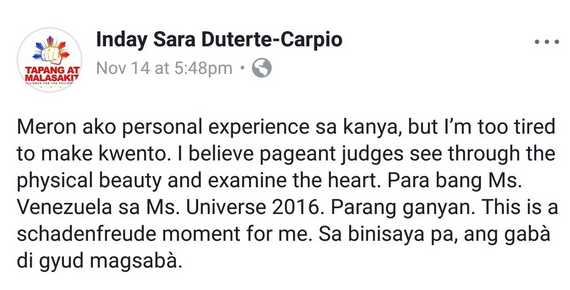 Sa binisaya pa, ang gabà di gyud magsabà,” Sara posted.